Dr. Jan Akervall, M.D., Ph.D.
One of the first penalties I received in flat track roller derby was an illegal procedure for removing my mouthguard during a jam. I remember this distinctly because I needed to communicate to my teammate, but the mouthguard I was wearing was too bulky for me to communicate easily, so I took it out and called the play. She heard the message but an officiator called the penalty and I was sent off the track annoyed. I never did that again. 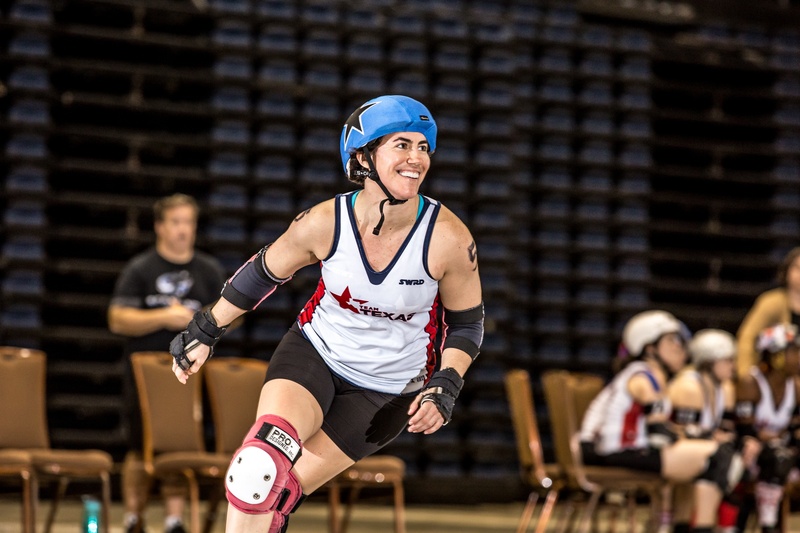 Roller derby is such a strategic sport, you need to have the ability to communicate when you want and with ease - just keep your mouthguard in! There are things you need to know if you’re going to be one of your team’s key communicators on the track. Here are 5 ways to improve your on-track communication now. Just because you are talking, does not mean others are listening. When communicating with teammates you need to be respectful. On the track some commands can come out rushed, overly aggressive or accusatory. Make sure that you are speaking to your teammates in a way that is not disrespectful and that will encourage listening. If you come off demeaning or angry, your teammate might not want to listen to you, even if you’re calling a really smart play. If you are simply speaking in the way that is most natural, and it’s always misconstrued by your team, explain that while off of the track, but keep working to make modifications in how you’re communicating your good ideas. Even if someone is listening, it doesn’t mean they understand. Humans are always giving one another indicators that we either understand others or we do not. If you are communicating to a teammate on the track, but they are not following your directions, there is a good chance that they do not understand your call. Rather than repeating the call word for word, try saying the call in a different way. For example, when you want your teammates to join you behind the pack and you yell out, “pack is back” but they don’t come, there’s a good chance that although that call means “come back here” for you, that’s not what it means for them. Don’t worry, coming up with multiple ways to say the same thing is easy- try to do it now. Even if someone understands what you are communicating, it doesn’t mean that they will agree with you, or do what you ask. One of the other indicators that humans are constantly giving to one another is that of disagreement. Sometimes this comes in violent extreme forms, and sometimes it’s as simple as a conversation in which two or more people discuss their differences. On the track, during a game, you don’t usually have time to hash out your ideas. That is why you must communicate to one another before you get on to the track, and for the hundreds of hours that you spend at practice when not competing. If you find that you are calling plays, but your teammates simply do not agree with you, this gives you a great opportunity to open up the floor for discussion. Sometimes these discussions actually lead to better strategy or understanding of the game. It’s amazing what can come from solid communication! If someone is speaking to you, really, actually, sincerely listen. These days it is so common to carry a conversation with a person while also using your phone at the same time. This means that at some point in the conversation you can’t actually be 100% engaged. If someone is speaking to you, especially in the pit, pre-jam, make sure to stop what you are doing and take a moment to listen to everything that they are saying. When on the track, if your teammate is talking to you, but they are constantly not able to get your attention, ask them to call you by name. This might help the two way communication. Don’t get an illegal procedure like I did for pulling out your mouthguard! I’d been wearing SISU Mouth guards for years before I became a sponsored skater. I remember the first time I saw them at WFTDA Championships, I was so excited to get mine out of the package and mold it to fit my teeth as snug as possible. Being a player who constantly talks on the tracks, plays in the majority of jams in a game and who drinks and eats constantly during practices and games, I need a mouthguard that fits like a glove, but also pops out easily whenever I need to shove food in my mouth. If your mouthguard leaves you feeling like you can’t speak clearly to teammates, or you’re gagging when it hits the back of your mouth, or it’s too hard to take in or out, you should look at finding a new one. Communication should be easy- and your mouthguard needs to compliment the ease of well-trained communication. Is Olympics Coverage Undermining Women's Achievements?